Summer is nearly here. Along with the warm weather and easy laid back lifestyle, there is a preponderance of barbecues, salads and cold light desserts. 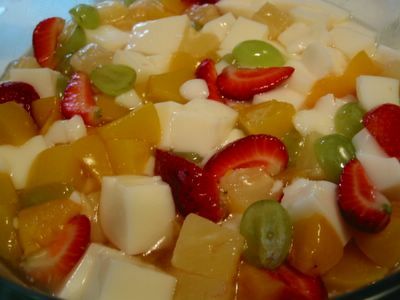 Often we have fruit salad in light syrup. Occassionally we 'garnish' it with some almond jelly. This is a staple in Chinese restaurants especially popular during dimsums. Very easy to make with few ingredients. I normally use agar-agar for this but since I don't have any I adapted the recipe using unflavoured gelatine powder we get from local supermarkets. [Update] If you'd like to see the round-up of all the entries to this IMBB edition, please click here. Thanks again to Elise for all the hard work. Sprinkle gelatine powder in a bowl with the 1 cup hot water. Stir until all of the gelatine is completely dissolved. Add 1 cup water then cool mixture to room temperature. 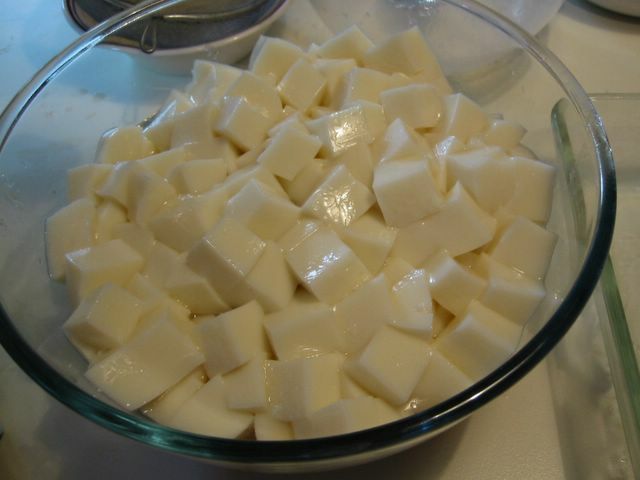 Stir in milk, almond essence, and sugar. Mix until sugar is completely dissolved. Pour into a wide container or glass baking pan. (I used a glass 13 x 9-inch pan). Cover container and chill in the fridge for at least 4 hours or overnight. Cut the set gelatine into cubes - about 1/2-inch square. Place in a big bowl and pour the fruit cocktail with the syrup on it. Mix gently and chill some more. Serve in bowls. *Note: You may use any combination of canned fruits and/or fresh fruits as long as it is in a light syrup. For the first picture above I used a can of peaches in syrup mixed with sliced fresh grapes and strawberries.